Showing results for tags 'pork skewers'. Even with the phenomenal amount of lead time, I didn't think I was going to get an entry in this month due to many factors, not withstanding the fact that I kept changing my mind about what I would do could achieve. LOL We have a very dear friend coming to visit this weekend, so I used it as an opportunity to make some things on the Kamado that I had only previously made indoors and on the Weber Baby Q. These are hand-on-heart some of my absolute favourite recipes and I'm really excited to share them with you guys and I really, really hope that you try some of them. ESPECIALLY the pork skewers and satay sauce!! They are amazing! Infinitely better on the Kamado (as you guys would already know!) LOL ... and the lemongrass curry... it's such a flavour bomb ... and the fishcakes aren't too shabby either LOL . Seriously though - they're very authentic in flavour and texture. My intent was to challenge myself by making dessert in the Kamado and I thought that a brownie would lend itself beautifully. I have to admit that I ended up doing it in the oven for the sake of timeliness. The Kamado was well-busy pumping out a curry, grilled chicken and pork skewers! Maybe I can convince hubby that we need a Junior? ha haaa! The recipes are too authentic to be my own because I'm not Thai but they are truly delicious and from some of my favourite food bloggers and cooking channels, so I will let you know who from and maybe they'll become yours too? Prep commenced last night ... so here goes. Lydia’s Little Thai Banquet Menu Pork Skewers with Satay Sauce (by Pailin's Hot Thai Kitchen - YouTube) Fish Cakes with Dipping Sauce (by Pailin's Hot Thai Kitchen - YouTube) Coconut Rice (by Recipe Tin Eats - Recipe blogger) Lemongrass Chicken Curry (by Not Quite Nigella - Food and Travel blogger - with some adaptations by me). 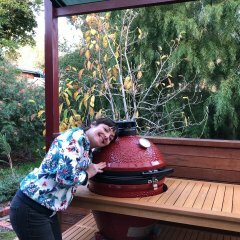 I have to mention that the idea of making the curry on the Kamado was inspired by Glenn's Aussie BBQ cooking channel on YouTube. The guy is a real character with some great recipes and techniques. Jaffa Brownie (Gemma's Bigger Bolder Baking - with adaptations by me) Pork Satay Skewers 450g pork loin steaks Marinade/brine (min 2 hours but preferably overnight) 1 1/2 teaspoons coriander seed (lightly toasted) 1/2 teaspoon cumin 1 Tablespoon lemongrass finely chopped (just the inside, remove the hard outer) 1 teaspoon chopped galangal 1/2 teaspoon turmeric (fresh or dried) 1/8 teaspoon white pepper 1/8 teaspoon cinnamon 1/8 teaspoon cloves 2 teaspoons brown sugar 1/2 teaspoon salt 1/3 cup coconut milk 1/2 Tablespoon vinegar 1/4 cup water Extra coconut milk for brushing when cooking Pound the lemongrass and galangal into as smooth a paste as you can using a mortar and pestle Add the toasted coriander seeds and grind Add remaining dry ingredients and grind Add wet ingredients and mix through With the steaks, cut them down the centre along the length of the steak and then slice into 1/4 inch / 6 cm pieces Marinade overnight if possible Next morning Soak your skewers (if bamboo) in water for a couple of hours Skewer 3 pieces onto each stick and try to get one piece with the fat strip on it, per skewer I bbq’d these direct on the kamado with all the coals pushed to one side and the cast iron grate in the lower position. Baste one side with plain coconut milk and placed basted side down on the grate and then baste the other side that is facing up. Peanut Sauce (also amaaaazing just served with veggies) I implore you to try making this!!! 1/2 cup roasted peanuts ground up rough in the food processor 2 Tablespoons lightly toasted white sesame seeds 1/4 cup coconut milk Plus 1 cup coconut milk 1/3 cup curry paste (either red or Penang) 2 Tablespoons brown sugar 2 to 3 Tablespoons tamarind juice (I soaked a 1/16th block of the package pictured in a small bowl of boiling water for 15 mins and then mushed it up using my fingers until there was nothing left to squeeze out and then strained out the solids to end up with the liquid). a splash or so of Fish sauce to taste Put 1/4 cup coconut milk into a small pot and reduce by half Add curry paste and cook, stirring until it's thickened and the red oil starts to separate (about 5 mins) Add the other cup of coconut milk and peanuts and sesame and stir until well combined Add sugar and tamarind juice Add a couple of splashes of fish sauce Simmer and keep stirring until thickened. Keep stirring, otherwise it will catch Taste and check whether extra sugar or fish sauce is needed for balance Mine sat for a while whilst I did all the other stuff so it was quite thick when I went to serve it, so just add some water and heat it up and it will be perfect Fish Cakes and Thai dipping sauce Dipping sauce 1 big red chilli (mild for flavour) 1 - 2 small Thai chills (spicy for heat) 3 cloves garlic 3 Tablespoons water 1/3 cup vinegar 1/2 teaspoon salt 1/2 cup sugar To serve: 1 tablespoon finely chopped cucumber 1 tablespoon ground roasted peanuts 1 tablespoon finely chopped purple shallot (I left this out because of an allergy) Blitz first 7 ingredients in blender Heat on stove, stirring until thickened (3 to 5 mins) Allow to cool Just prior to serving, add cucumber, peanuts and shallots (and a bit of water to loosen up if needed) Fish cakes 350g tender white fish (must be very cold from fridge) 2 to 3 Tablespoons red curry paste 1 egg yolk 1 teaspoon sugar 1 teaspoon fish sauce 1/2 cup green beans chopped into small bits 1/3 cup Thai basil (spicy) 4 -5 kaffir lime leaves finely shredded (I substitute with lemon myrtle leaves because I have a tree) Blend up very cold fish and curry paste, egg yolk and sugar in blender until well combined and mixture is bouncy (doesn't take long at all) Transfer to a bowl and combine remaining ingredients with a spatula Using wet hands and tablespoon, form into small patties and then shallow fry in something like rice bran or peanut oil. If you have dry hands, you will end up with a sticky mess and wasted ingredients). Pan fry until golden brown. Coconut rice The secret is using coconut powder (not coconut milk!) and kaffir lime (or lemon myrtle) leaves. Coconut powder makes the rice light and fluffy without the residual gunk on the surface you get from using coconut milk, and the kaffir lime leaves is the secret ingredient that gives this rice that special aroma. 1 cup jasmine rice (or long grain) 1 1/2 cups water 1 packet coconut milk powder (1.75 oz / 50 g) 2 large or 3 small kaffir lime leaves , crumpled in your hand (I used lemon myrtle from my tree) 1/2 tsp salt 3/4 tsp sugar 1 tbsp desiccated coconut , toasted, to garnish (optional) - I just topped with a little finely shredded lemon myrtle leaf that I had set aside for the job 1. Combine all ingredients in a saucepan over high heat. 2. Place lid on (clear glass lid is good if you don't have x-ray vision) 3. When it comes to the boil, (watch it, you don’t want it to boil over), turn the heat down to low so it is simmering gently 4. Leave to simmer for 12 to 15 mins or until all the liquid has been absorbed 5. Remove from the heat and rest for 5 to 10 mins 6. Fluff with a form and garnish with toasted coconut or extra shredded lime leaf, if using and then serve Lemongrass Chicken Curry 500g chicken thigh (which I pounded slightly to even out thickness) prior to grilling on cast iron grate in lower position at 200C 2 sticks lemongrass Coconut or peanut oil for frying 1 onion, peeled and chopped fairly small dice (or four purple shallots as shown above) 2 cloves garlic, peeled and sliced 1 inch ginger, sliced 4cm stick of turmeric, peeled and chopped into small bits 1 - 2 small chillies - sliced 2 tomatoes - chopped (I forgot to include them in the photo) 2 tablespoons fish sauce 1.5 teaspoons sugar 1 cup water 1/2 cup coconut milk (optional) I added some tofu puffs which are amazing flavour explosions because they're like curry-sauce-absorbing-sponges, as well as some baby corn and snow peas . Split the lemongrass sticks in half horizontally and bash the cut side with the blunt end of a knife. Place the onion, garlic, ginger, turmeric and chilli in a mortar and pestle or a food processor and bash or process away. I set up the kamado with half coals on one side to create direct and indirect zones and then placed the wire grates in the top position I added coconut oil to a cast iron low skillet with a lid and fried the paste mixture until fragrant and then added the corn Add the lemongrass and tomatoes. Then add the fish sauce, water and sugar. Simmer for 20-30 minutes covered. Add snow peas and and tofu 5-10 mins before serving Set aside Cook off the chicken thighs in lower position as described above and then chop and add to the curry. Jaffa brownie Jaffa Brownie My grand plan was to make this on the Kamado but I was creating a rod for my own back, so that didn't happen. I’m definitely not going to tell you American peeps how to make a brownie because I’m sure you all have handed-down family recipes far superior to mine, but my twist is to add the microplaned rind of an orange to really lift the flavour. Choc orange is one of my favourite dessert flavour combos. I would really love if you would try some of these recipes and let me know if you do and what you think of them. Bon Apetit.